Exciting World Workplace Asia pre-conference activities continues in May, and a group of 30+ participants shared the joy of the Macau trip. We all took the CotaiJet to Macau Taipa Ferry Terminal early in the morning and started the inspiring experience at City of Dreams specially designed for us by Mr. Raymond Koh – Vice President, Engineering of COD. Many of you might have watched the spectacular, water-based House of Dancing Water show, but I am sure not many of you have had the backstage tour to this first purpose-built theatre with advanced technology. 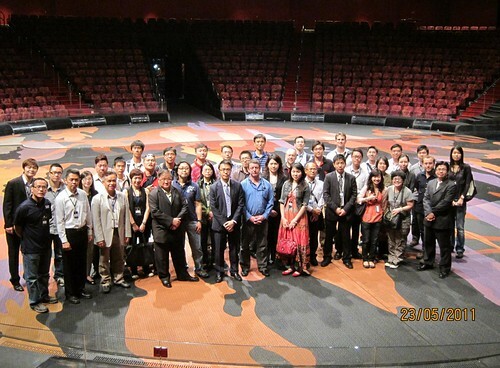 The group was also amazed by the Dragon Treasure show in The Bubble, and enjoyed a light lunch in City of Dreams, then rounded up the journey with a combination of facilities, attractions and amenities in Venetian touring by Mr. Albert Chuck – Chairman of Macau Properties and Facilities Management Association (MPFMA) and Chief Engineer of The Venetian Macao Resort-Hotel. The world class exhibition venue in Venetian has been hosting a lot of international conferences and entertainment events entertainment arena is the largest of any hotel in Asia with the capacity to hold up to 15,000 roaring fans with capacity to house 15,000 roaring fan and banquets of hundreds tables. Currently, the Ice World and the award winning ZAIA Cirque du Soleil show are still on! We wish to extend our special appreciation to Mr. Raymond Koh, Mr. Albert Chuck and their professional team again in organizing the trip and sharing their valuable operating experience with us. Stay tuned with us for the coming events!